Even though I’ve been to Kauai more than 30 times, there’s always something new to discover. This trip, my husband was able to join me and I wanted him to realize what an incredible food scene there is on Kauai! That’s why we wanted to do a Kauai food tour! Tasting Kauai is the best option for food tours on Kauai. They offer them all over the island and each one has a different focus. After reading through all the descriptions on their website, scrolling through their Facebook page, and stalking them on Instagram, I finally decided to try their North Shore food tour. 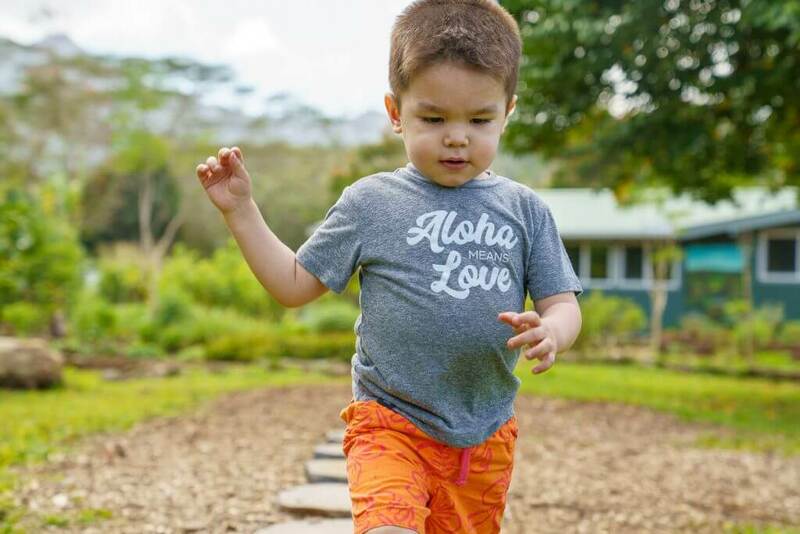 This trip, my family stayed at the stunning Grand Hyatt Kauai Resort & Spa in Poipu. I knew we’d be spending a lot of time on the South Shore and would have opportunities to try food around our resort. So, I figured booking this North Shore tour would ensure that we’d spend at least a few hours checking out restaurants we might not get to on our own. 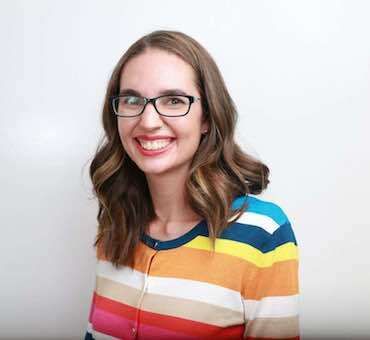 Plus, the North Shore is known for being trendy and super organic and I was curious to find out some of the hot spots! My husband and I shared our portions with our kids (ages 2 and 5) and my mom came along to check out the tour and help us with the kids so we could take photos and video. Thanks Mom! This food tour of Kauai started in Kilauea and ended in Hanalei. There were 7 places on the tour. There were a few stops where we could walk, but most of the time we drove to the next location. Our Kauai food tour guide shouted driving instructions and we all tried to caravan. No one got lost. These Kauai food tour stops do change from time to time, so this is specifically where we stopped on our tour in March 2019. The first stop of this Kauai food tour actually doesn’t involve food. Instead, it’s all about the drinks! Kauai Juice Co has several locations around Kauai, but this tour stops at their Kilauea location. Their Kapaa location has an awesome pineapple Instagram wall! When we visited, they were excited to share their kombucha with us. I had tried a couple different bottles of kombucha from Costco and around Seattle and wasn’t impressed. It was too sour and biting for me. 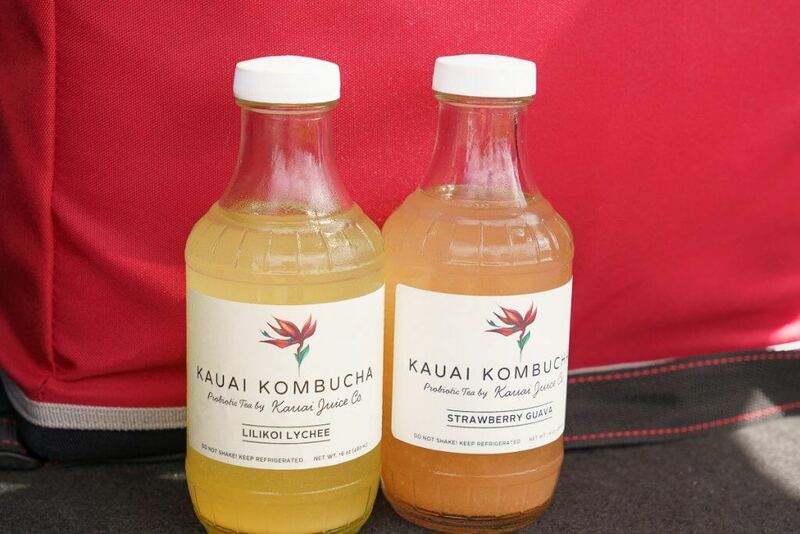 But, Kauai Juice Co mixes in their signature tropical juices, which is the perfect balance for this fermented drink! Their staff offered us 3 different flavors of kombucha they had “on tap” and I liked tasting the different levels of sweetness. After our tasting, each of us got to choose our own bottle to take with us. I chose Lilikoi Lychee and it was awesome! 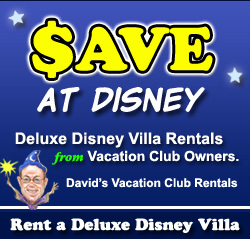 They also have a program where you can return your empty bottles for cash back. Find out more about Kauai Juice Co.
Our next stop was our first real food on this tour. Sushi Girl is located right across the street from Kauai Juice Co in the Kong Lung Historic Market Center. They are known for something unique. 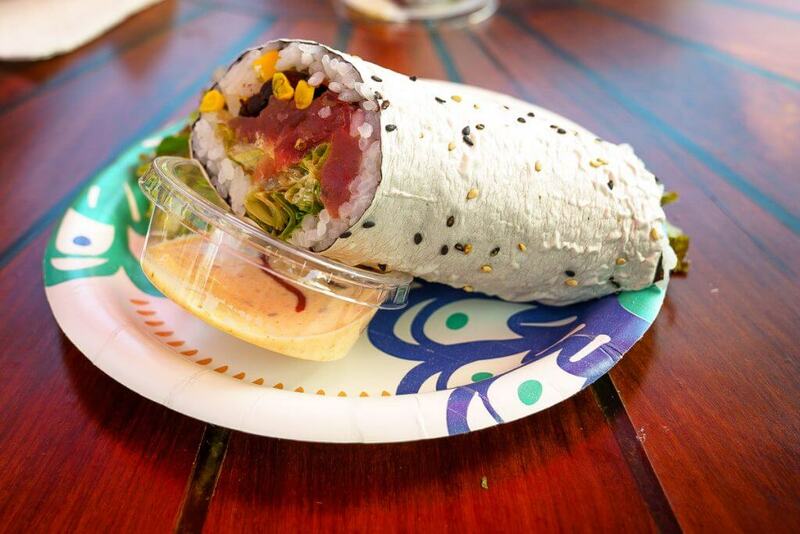 Two words: sushi burrito. We tried “The O.G.” which is avocado, corn, black beans, greens, and raw ahi fish rolled up with a lot of rice in a white soy wrapper. I think all the white color was a bit off-putting to me. But, one bite in and I was already eager to add Sushi Girl to my favorite places to eat on Kauai! It tastes exactly how it sounds. Like a Southwest-inspired sushi hand roll with hints of California. And you have to dip it in their “yum yum” sauce! So tasty! Since this was the first food stop on the tour, I had to pace myself and didn’t finish my sample. But, had we just stopped there for lunch, I would have devoured the entire plateful of food. Find out more about Sushi Girl. I think this is one of the “punniest” names! Kauai Farmacy is off the highway and down a dirt road. You would definitely miss it if you didn’t know it was there. It’s a farm where they grow lots of medicinal herbs and create products to help people soothe their ailments naturally. We got to taste a few different blends of tea. I liked the Love Potion and Tropical Chai teas. And they passed around spices to smell. My kids got a kick out of cracking their own macadamia nuts! They were less thrilled about tasting them, though! We also got to try Spilanthes. It’s a bud that when you bite it, provides a fizzy/numbing sensation. It’s used for toothaches. I’d never heard of it and was surprised how quickly it worked! The effects only last 5 minutes or so (at least for half a bud). The grounds itself are really pretty. There are lots of plants (of course) but also interesting seating options and a rustic jungle gym. My kids enjoyed hopping along their stone path, too! 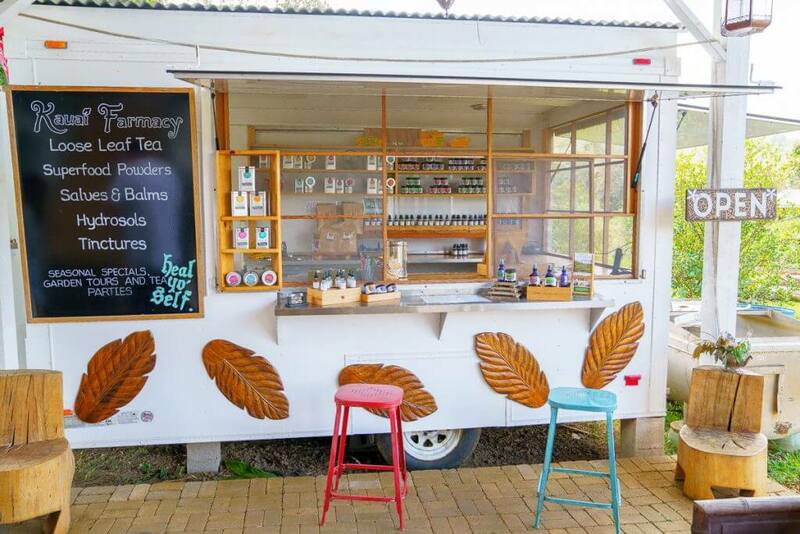 They offer a garden tour about how to use medicinal herbs that sounds pretty fascinating! Find out more about Kauai Farmacy. I know what you’re thinking. Really? I’m going to pay money to eat gas station food? Yep. And you’ll want to go back for seconds. Trust me. We did later that week! When the owner took over the North Shore General Store at the 76 Station in Princeville a few years ago, he realized he could revamp their whole kitchen set-up. So, he ordered a pizza over from New York City, which was trucked across the country, put on a boat, and arrived on Kauai weeks later. From there, they experimented on tweaked their recipe to create unbelievable pizza! We got to try their “The Works” pizza and chili pepper chicken. According to my 5 year old, “This is the BEST pizza ever!” At least that’s what he shouted as he devoured his piece of pizza. The crust has the right amount of crunch and the toppings are fantastic. It’s flavorful, satisfying, and perfect to pick up and take with you to the beach or bring back to your hotel. We also really enjoyed the chili pepper chicken and rice. They also make Kauai-grown beef burgers, breakfast items, calzones, hot dogs, plate lunches, macadamia nut cookies, and more. Like I said, we called in an order for pizza later that week and brought it to the park. Great kid-friendly lunch! Find out more about North Shore General Store. When our tour guide said we’d be meeting a guy in a parking lot to hear about dried fruit, I immediately lowered my expectations. I like dried fruit as much as anyone. But when I go to Hawaii, I want to eat up all the fresh, local, tropical fruit. Plus, they sell dried fruit at any grocery store across the U.S.
Our tour guide kept pitching Uncle Mikey as a character and someone we’d want to chat with. I thought that was her code for saying we were just there to be entertained before our next stop. So, when he started passing out little baggies of dried fruit for us to try, I just took a small piece to say I tried it. Holy cow! It’s seriously the most flavorful dried fruit I’ve ever had! I think it’s because he doesn’t use sugar or other additives. It’s just dehydrated fruit. The flavors popped in my mouth and tasted just like they do when they are fresh. I’m talking about papaya, mango, pineapple, Kauai’s famous apple bananas, and coconut! And it’s not leathery or gummy. Just plain and simple dehydrated fruit and it’s the perfect taste of Kauai! I’m so glad he was generous with his samples because I tried every single type of dried fruit he had. And then we bought 3 bags to bring home with us. It’s seriously amazing! 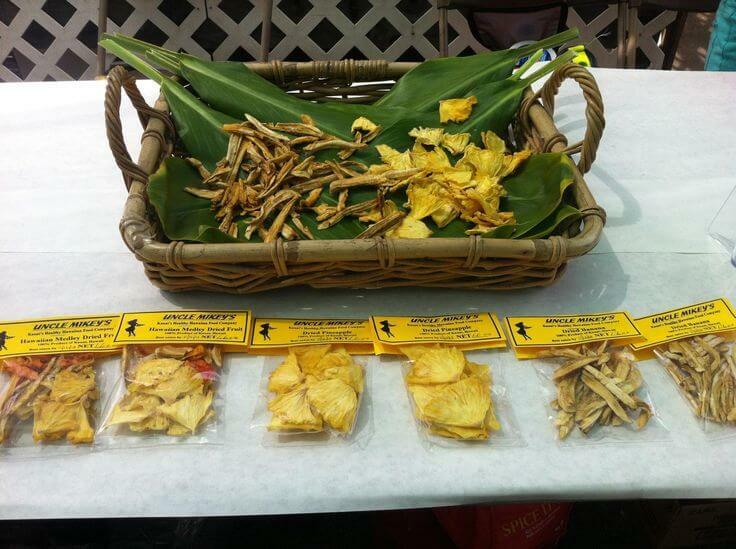 Find out more about Uncle Mikey’s Dried Fruit. We ended our tour in Hanalei, which is famous for their taro fields. There’s even a scenic lookout where you can see the “patchwork quilt” design of the fields. So, it was only fitting that we’d taste the much-talked-about poi. While it used to annoy me that they would perpetuate the stereotype that poi isn’t good, now I don’t mind because that means more for the rest of us! You can find Hanalei Poi at local grocery stores on the island, but this food truck offers lots of additional taro products like taro hummus, taro veggie burgers, taro mochi cake, and taro smoothies. 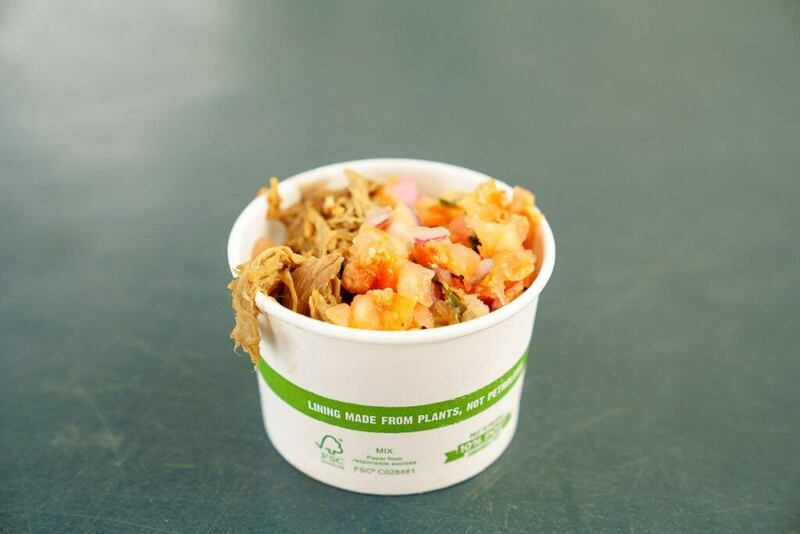 We got to sample their Kalua Poi Bowl. It’s a bowl with kalua pork, lomi lomi salmon, and fresh poi. The combination of these flavors was incredible! I loved it so much that I tried to recreate this combo at Smith’s Garden Luau later that week! 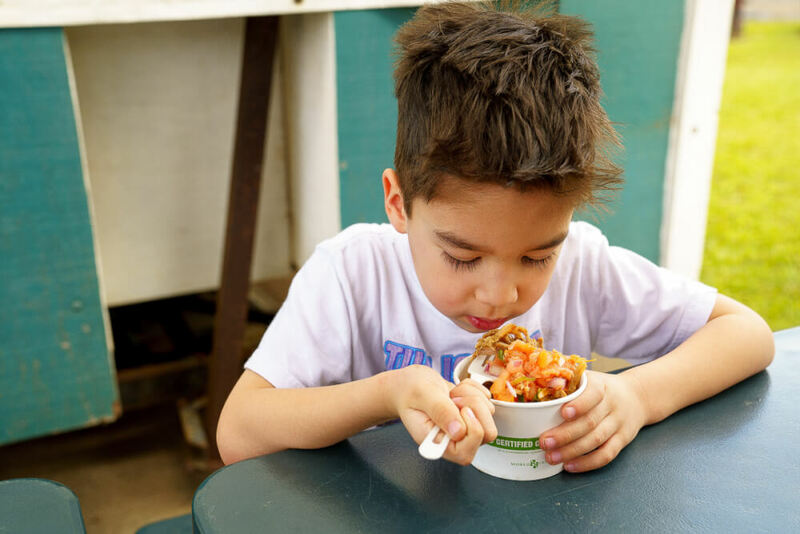 Find out more about Hanalei Taro & Juice Co.
Our final stop was Wishing Well Shave Ice across the parking lot from Hanalei Taro & Juice Co.
My mom has been talking about this place for the past couple of years and I think she even took my oldest when he visited one time. I’m somewhat of a shave ice snob and this was one of the shave ice spots on my Kauai foodie list. We tried their passion fruit shave ice with freshly cut papaya and it was divine! The ice was shaved so finely that it had almost a creamy texture. Plus, they offer organic, house-made fruit syrups. 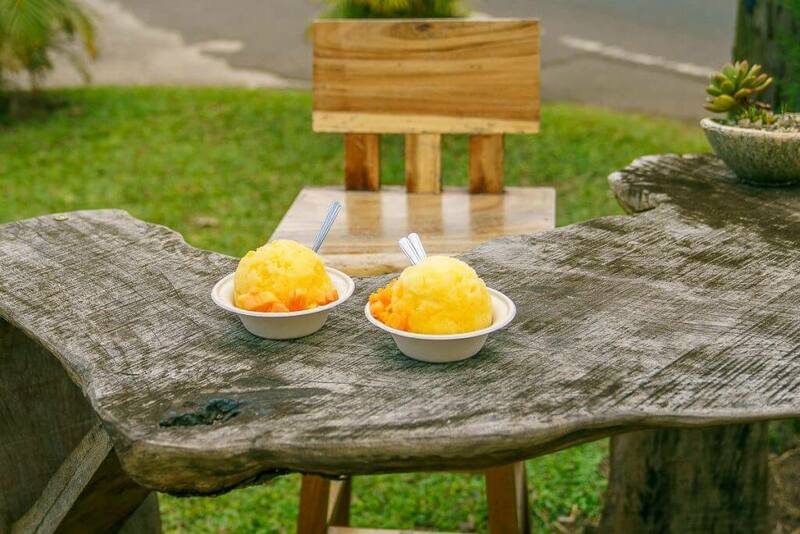 It’s really no wonder that this is one of the top shave ice spots on Kauai! Not only is the shave ice incredible, but it’s in such a picturesque spot! There’s lots of artsy boutiques nearby and this shave ice stand sells their own merchandise. I actually featured Wishing Well Shave Ice in my post about the Best Shave Ice on Kauai. Find out more about Wishing Well Shave Ice. Why Should You Book a Tasting Kauai Food Tour? My motto for family vacations is we don’t want to waste meals on mediocre food. What I love about these Tasting Kauai Food Tours is that you get to try the signature item at local Kauai stops. And the sample size is just enough to give you the full experience, without making you too full to continue the tour. If you are a Kauai newbie, going on a food tour of Kauai is a great way to familiarize yourself with the island, plus taste a lot of food items you might not find on your own. Plus, you’ll meet lots of local business owners, your tour guide, and other participants who can share tips and their favorite spots on the island. If you’ve visited Kauai a few times, you probably have a few favorite restaurants that you always visit. That’s great! But, a food tour gives you the opportunity to try a lot of new places without sacrificing all your mealtimes. So, you can still go to your must-eat Kauai restaurants, while also discovering a few new favorites. Win-Win! 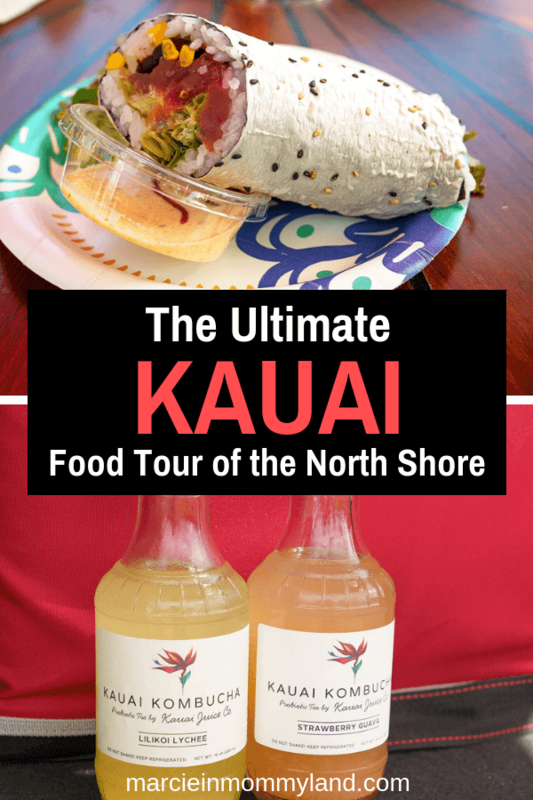 If you live on Kauai (like my mom), a Kauai food tour is a great way to check out the food scene on a different part of the island. And if you’re in the tourism industry, it’s a great way to chat with visitors and see what types of restaurants and food items seem to be the biggest draw. 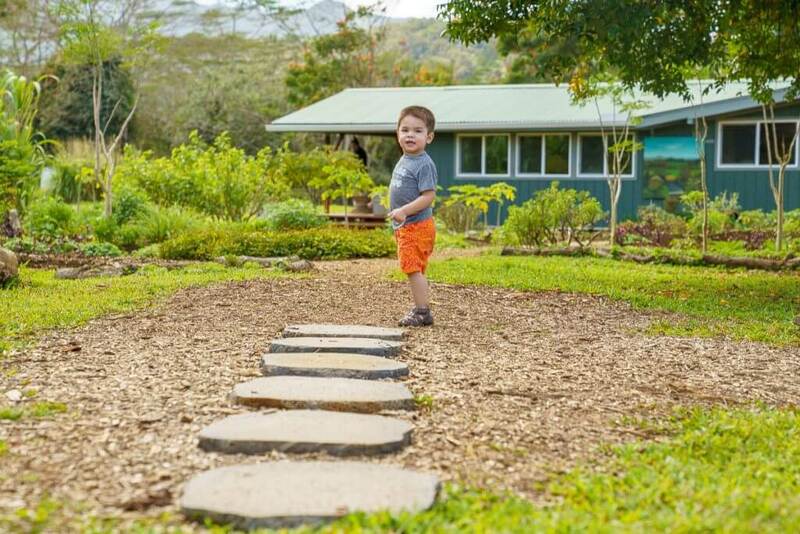 Is this Kauai Food Tour Kid-Friendly? YES! My husband and I kept saying that we loved the pace of this tour because we had enough time at each stop for potty breaks. And there were places for the kids to run around. Plus, there wasn’t too much driving. And the drives were short, so we didn’t have to worry about the kids falling asleep. Sample portions are generous enough to share with young kids. I think it’s a great way for kids to try local cuisine without wasting food. If you’re staying at one of the popular Poipu resorts, this Kauai food tour is so convenient! This tour is every Wednesday. You’ll get six tastings including award-winning sushi and molecular gastronomy. Plus, taste tropical fruit jams and sweet treats. And you’ll get to visit a gourmet farmers market! Explore Kauai’s Royal Coconut Coast with this Kauai food tour every Thursday. You’ll get six tastings, including private tastings with some of the East Shore’s top chefs. 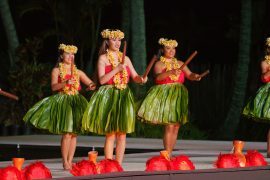 And enjoy farm-to-table food while hearing the unique story of Kapaa. 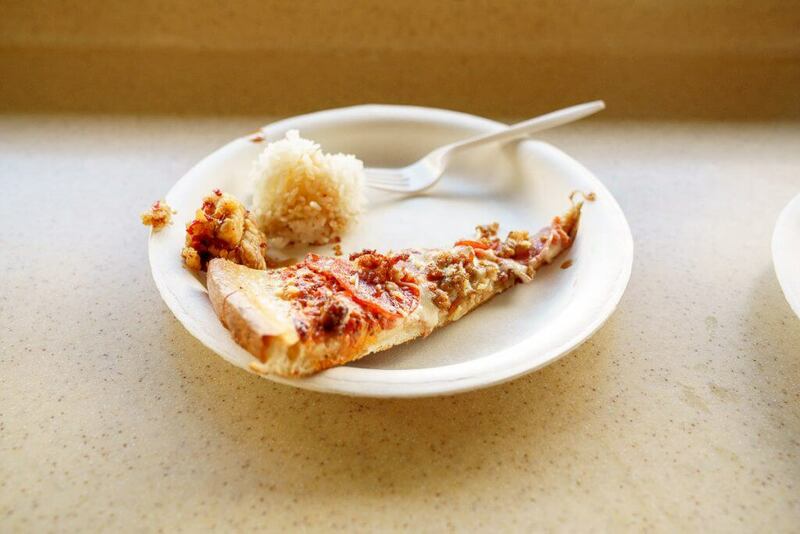 This tour focuses on foods local people in Kauai eat. This tour is every Saturday and it sounds pretty interesting for those who want to know more about where their food comes from and about Kauai’s agricultural programs. 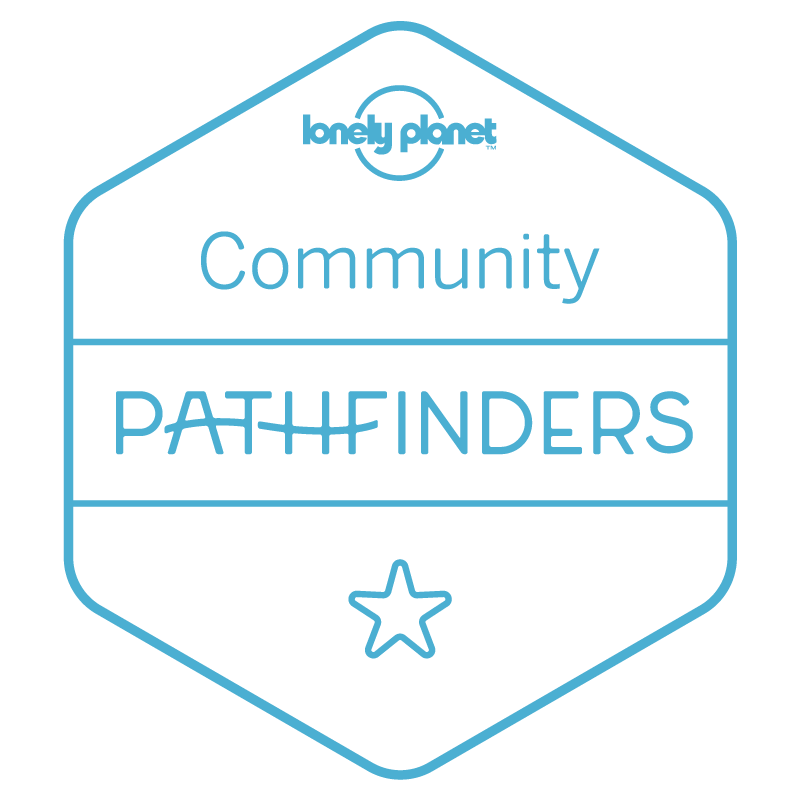 You’ll get to meet local farmers, explore farmer’s markets, taste farm to table cuisine, and check out a brewery! Hanapepe is Kauai’s biggest little town. It’s also the home of Disney’s Lilo & Stitch! This cute little town is completely walkable and features galleries, boutique shops, and little cafes with amazing food! This tour is every Friday. And after your tour, you’ll want to save time to walk across the Hanapepe Swinging Bridge! Tasting Kauai gave us 2 complimentary tickets in exchange for my honest feedback. All opinions are my own. I love Kombucha! I would love to try this one!! It’s the only time I really enjoyed it! I drank it the entire trip! Oh wow, what an amazing trip!! The food all looks so delicious. We lucked out with awesome food options everywhere we went! oh I love finding awesome brands for kombuchas! everything looks and sounds awesome! It’s the first one I’ve actually craved! Perfect blend of flavors! Great post, and I love that gas station chicken! Now I’ve got a few more spots to add to my north shore eating list. Thanks! It’s so good! Can’t wait to eat at these spots again on our next trip! Love this, Marcie! We went to Kauai Juice Co. a bunch (just kept refilling the glass bottle! )–such amazing Kombucha. There are so many spots that I want to remember to hit for our next visit to Kauai! I’d been really excited to try Kauai Juice Co. because my mom goes there a lot! We gave her all our glass bottles when we left! A sushi burrito?! That looks incredible. I’ve been to Maui and loved all the food. It was incredible! So refreshing and satisfying! 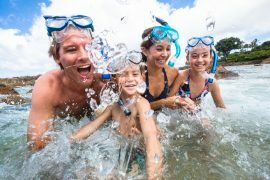 This looks like such a great idea – will definitely have to try this out when we head back to Kauai someday! For sure! And they have them all over the island! Book some food tours! They even have some in Seattle! I’m hoping to do at least one this summer! What a great tour! Everything looks delicious! They were all hits, which surprised me! So many amazing food options!